This book covers his entire career from 1921 to 1978, highlighting the many aspects of his work, from architecture to industrial design. from furniture to lighting, from the creation of magazines to its foray into the fields of glass, ceramics and goldsmithery. 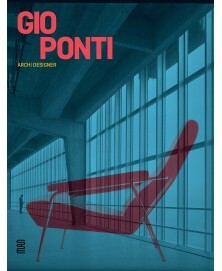 More than 500 pieces trace this multidisciplinary journey through architecture, furniture, installations for private homes or public buildings (universities, cathedrals), displaying the creative world of this legendary figure of the Italian scene, whose generosity and enthusiasm have stimulated his contemporaries and still inspire new generations of designers and architects. Hardcover, 312 pages, cm 24,5 x 32. Available in English and French.